Where does the WSOP take place? 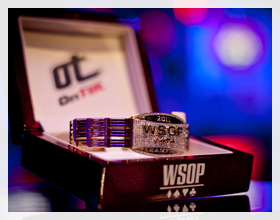 The answer to this one is so we are also going to explain to you what WSOP is so don’t have any doubt left after reading this article. First, WSOP stands for World Series of Poker, a poker tournament which started in 1970 when a poker player invited 7 other master poker players to play in a single tournament. Since then, there have been world records made and broken, pots won and lost, and men and women crowned Main Event Champions. Between 2000 and 2006, the number of entrants grew to staggering numbers, but with restrictions brought on by online gaming legislation, the number of people who qualify has dropped. The first place prize in 1970 is unknown, but the following year the winner won a “whopping” $80k, which is considered pittance when you discover that the first place prize in 2012 was over $8 MILLION. With a main event buy-in of $10k, you might want to set your sights on smaller fish, but if you have the cash and the skill, you might want to head for Las Vegas. Every year the World Series of Poker is held in Las Vegas Nevada, and is sponsored by Caesar’s Entertainment (once known as Harrah’s Entertainment until 2010). WSOP has morphed from a friendly game among a small group of elite poker players into a televised poker extravaganza.